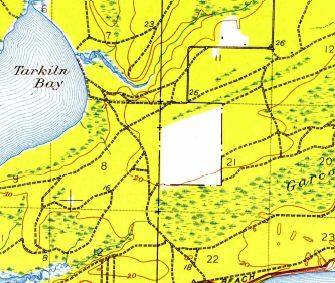 The 1941 USGS topo map (courtesy of Dallam Oliver-Lee) depicted a rectangular clearing at the site of Bauer Field, but did not label it. to support Navy flight training in the Pensacola area. According to Brian Rehwinkel, “Bauer was part of a large expansion of outlying fields in 1940 & 1941. (some were fields that had been previously been leased, and some were completely new airfields). Bauer OLF was originally called 'Site 1940-e'. The Bureau of Aeronautics number for this fields was # 26708. 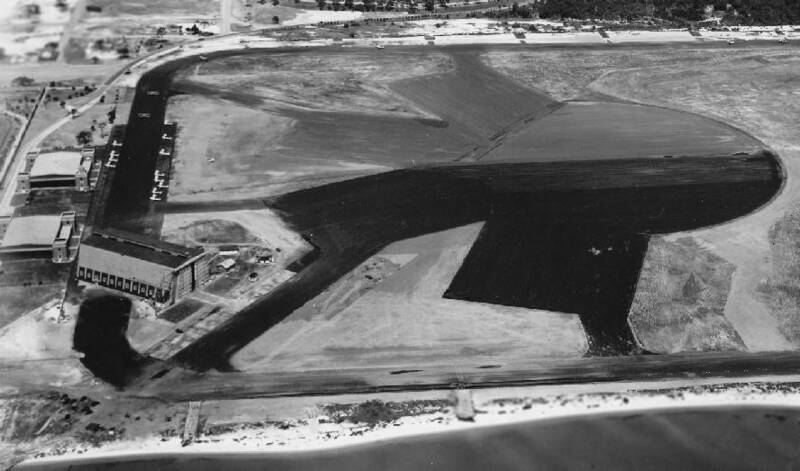 Brian continued, “The Navy purchased the just under 120 acres in early 1941 & developed a sod airfield for training. The field was expanded to include an additional 1,280 acres for a total of 1,400 acres. (apparently, the Navy never used the land for bombing). which depicted an unlabeled rectangular clearing. 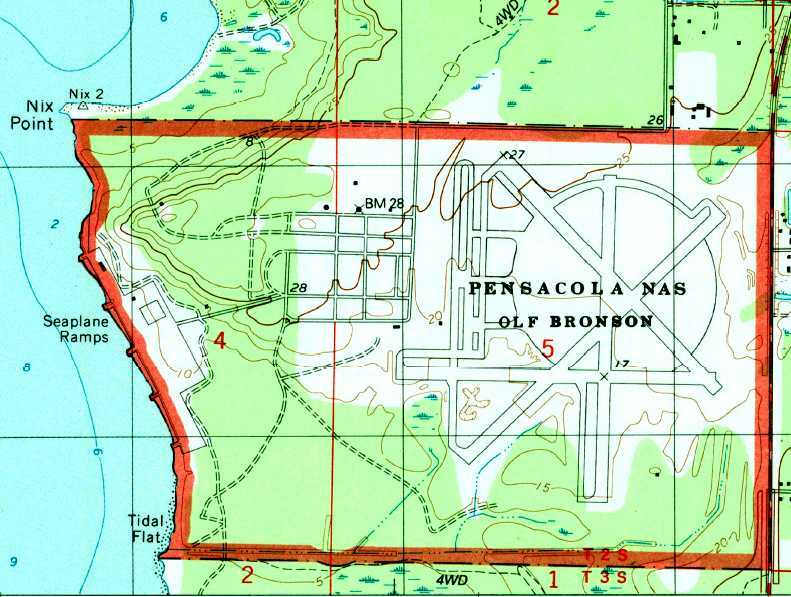 Bauer Field & Bronson Field, as depicted on a 6/30/42 map showing the location of Outlying Fields for NAS Pensacola (National Archives, courtesy of Brian Rehwinkel). 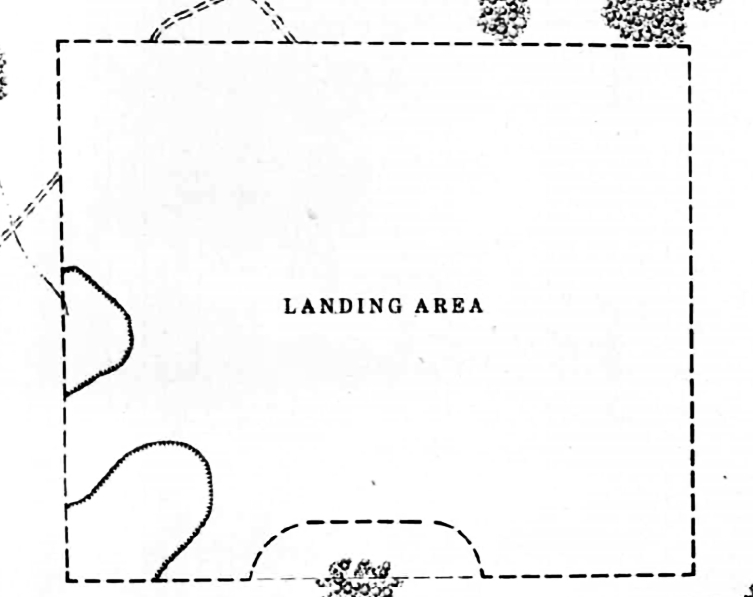 showing the landing circle in the middle of the field (National Archives, courtesy of Brian Rehwinkel). The earliest aeronautical chart depiction which has been located of Bauer Fied was on the July 1945 Mobile Sectional Chart. 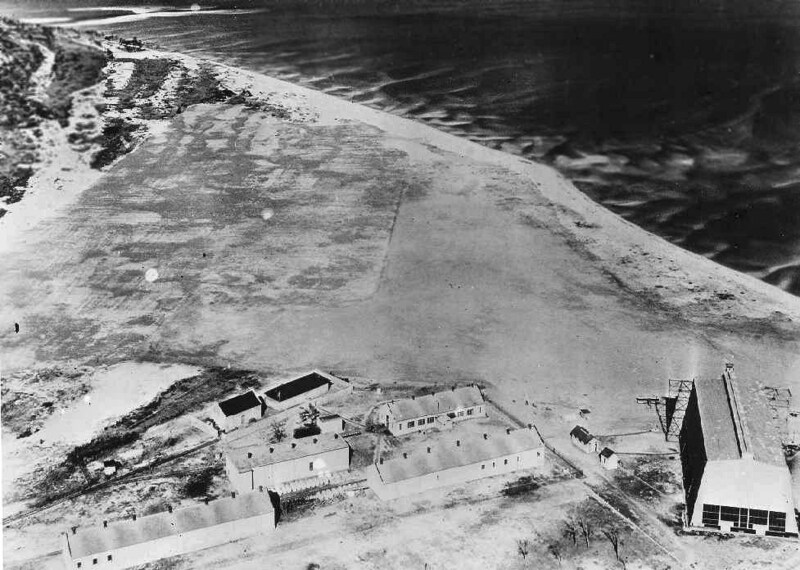 It depicted “Bauer (Navy)” as an auxiliary airfield. as a rectangular property having a sod all-way landing area. The field was not said to have any hangars, to owned by the U.S. Government & operated by the Navy. 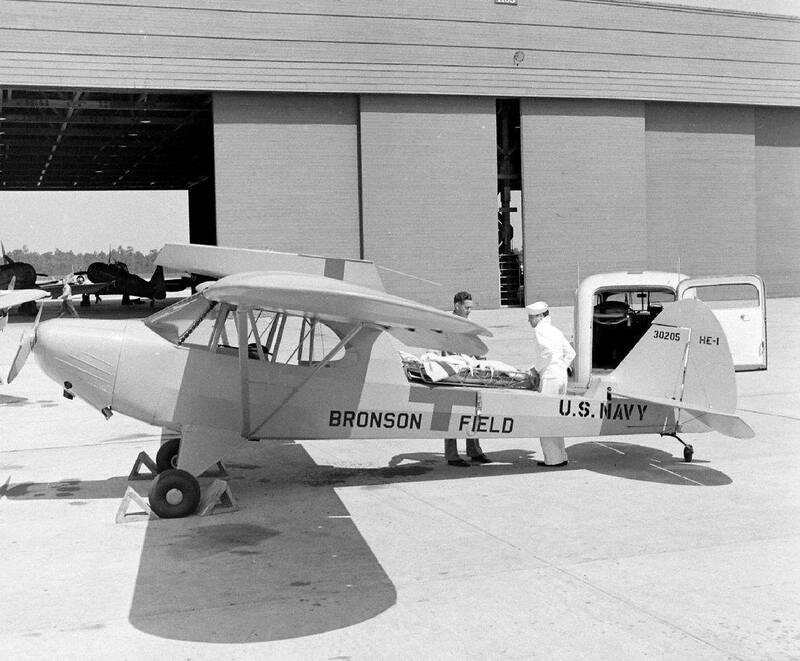 According to Brian Rehwinkel, “Although Bauer OLF was originally used by planes from NAS Pensacola, it was assigned to NAS Bronson during World War II. with the provision the Navy could still use the field for emergency landings & for the dropping of sleeve targets. The Navy continued to lease the 1,280 acres for a short period of time after the war. as it was no longer depicted on the 1949 Mobile Sectional Chart. but did not show any other improvements nor any sign of recent usage. 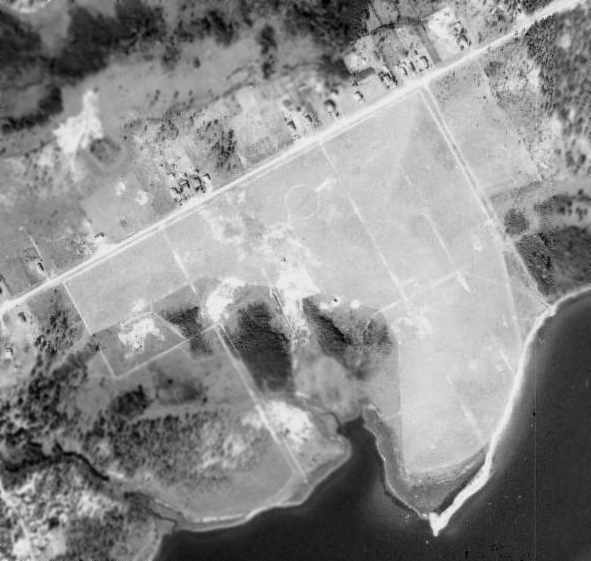 A 1965 USGS aerial view (courtesy of Dallam Oliver-Lee) showed Sorrento Road had been built through the center of the airfield site. A 1979 USGS aerial view (courtesy of Dallam Oliver-Lee) showed the Bauer Field property remained otherwise unredeveloped. A 2018 aerial view looking north showed no recognizable trace remaining of Bauer Field, with a middle school, housing, and woods occupying the site. the name of which is the only apparent remnant of the airfield. 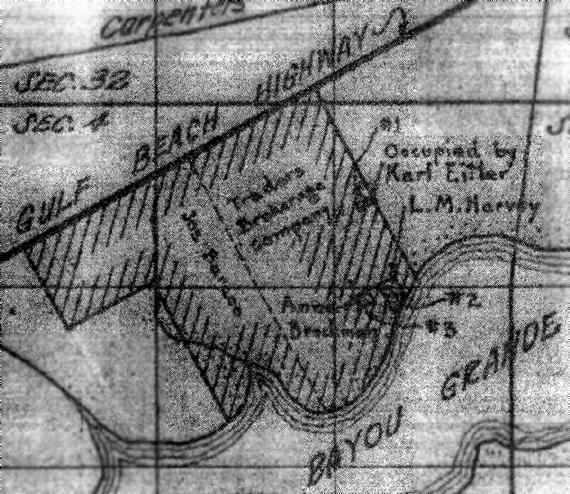 A 9/1/36 plat plan of the property of Bayou Field (from Navy files at the National Archives, courtesy of Brian Rehwinkel). Bayou Field was first used by the Navy sometime in the early 1930s (before 1935). The L-shaped grass field consisted of about 83 acres. 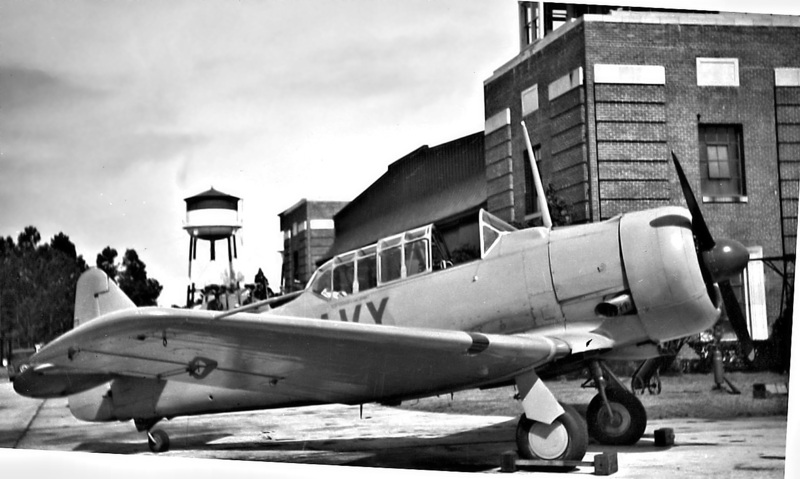 the Navy was using for training purposes by 1935 to support flight training operations at the Pensacola Flight School. except under south wind conditions and it is accordingly rarely used." Apparently, that condition was corrected, because the field was used for aviation purposes for most of the next 10 or 15 years. 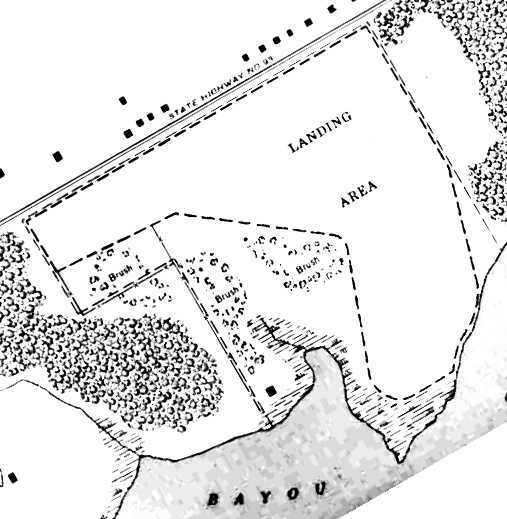 The earliest depiction of Bayou Field which has been located was on a 1939 map of NAS Pensacola & its satellite fields (courtesy of Brian Rehwinkel). 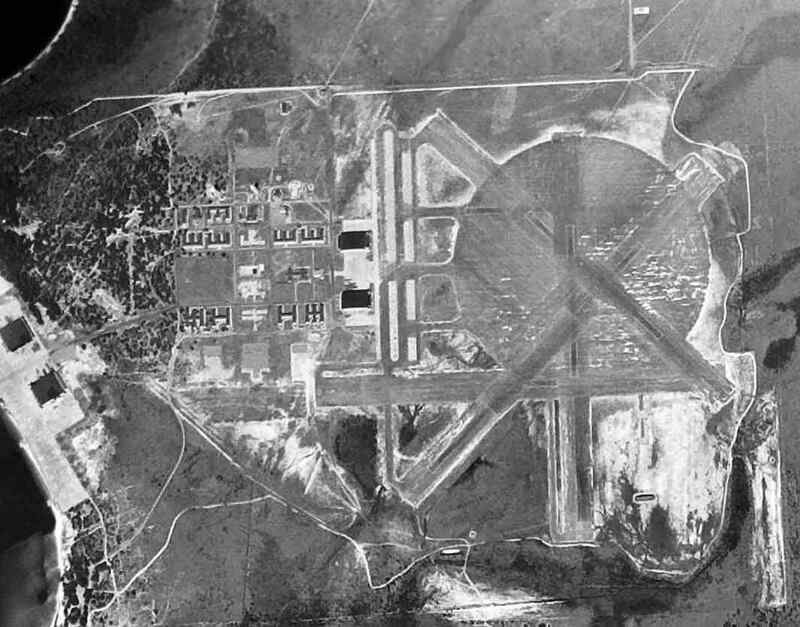 It depicted Bayou Field as having an "L"-shaped airfield area. Bayou Field consisted of an irregularly-shaped grass area, with runways oriented northeast/southwest & northwest/southeast. What may have been a single airplane was visible on the center of the field, just south of the airfield circle. 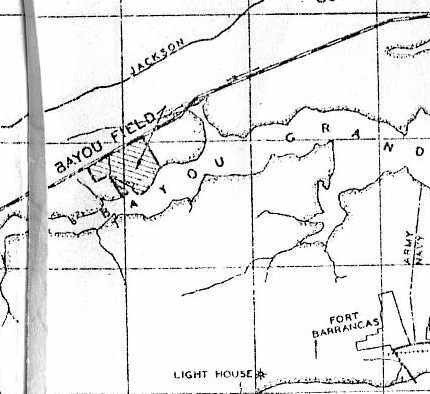 The 1944 USGS topo map depicted the property outline of Bayou Field, but did not label the airfield. The earliest aeronautical chart depiction which has been located of Bayou Fied was on the July 1945 Mobile Sectional Chart. 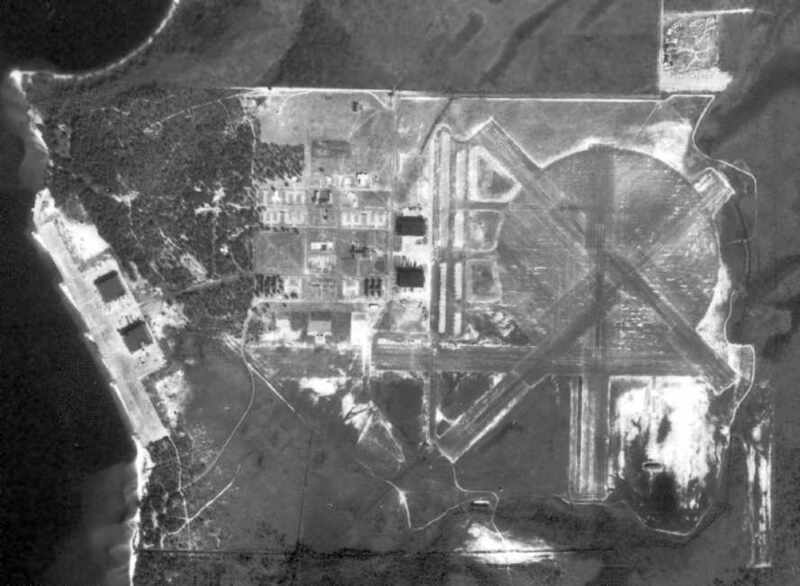 It depicted “ Bayou (Navy)” as an auxiliary airfield. as an 83 acre irregularly-shaped field having a 2,425' x 2,100' turf all-way landing area. to owned by the U.S. Government & operated by the Navy. as it was no longer depicted on the August 1946 Mobile Sectional Chart. as that is how it was depicted on the February 1949 Mobile Sectional Chart. 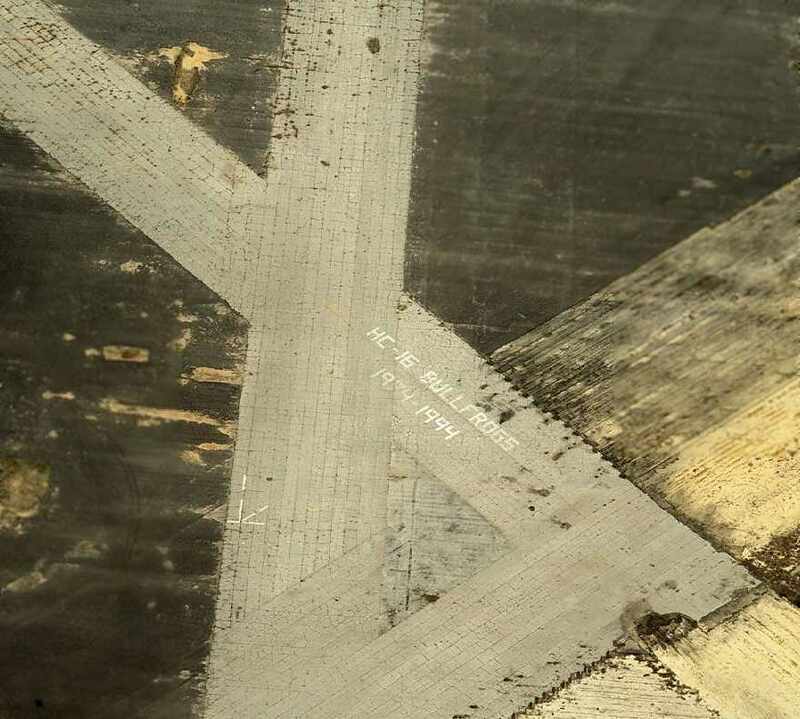 "Bayou" was depicted as having a 2,400' unpaved runway. 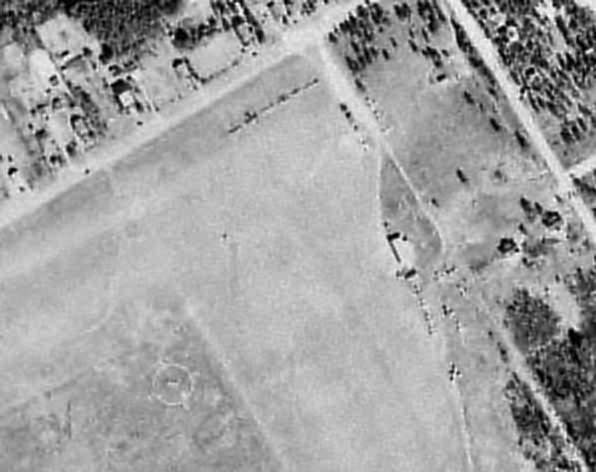 as this close-up of the 1/5/51 USDA aerial view depicted a total of at least 19 aircraft on the field. A single small hangar or shed was visible along the east side of the field. The last aeronautical chart depiction which has been located of Bayou Field was on the February 1955 Mobile Sectional Chart. 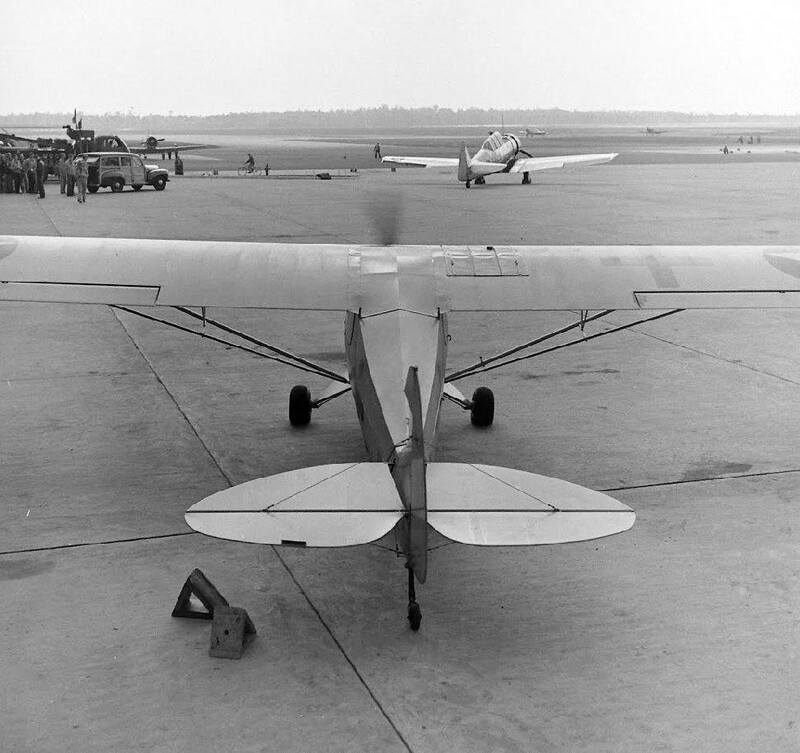 "Bayou" was described as having a 2,400' unpaved runway. [a nearby WW2 Army coastal defense post] and transferred the land to the Navy. The Navy then built Forrest Sherman Field - which became operational in 1955.
as it was located almost directly in the path of Sherman Field's north/south runway." "The field has been abandoned at this point & roads for development are being cut into the area of the former field." By the time of the March 1960 Mobile Sectional Chart, Bayou Field was no longer depicted at all. The last photo which has been located showing Bayou Field intact was a 1/31/65 USGS aerial view (courtesy of Dallam Oliver-Lee). 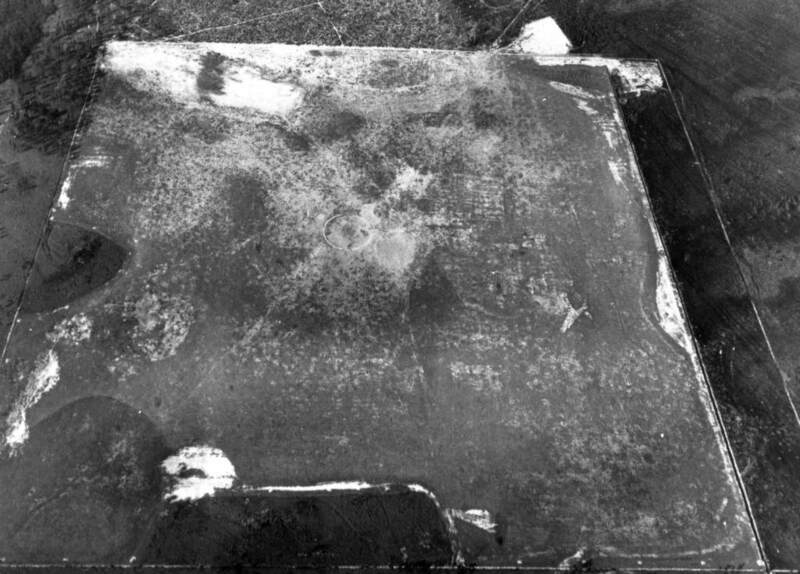 The large airfield circle marking was still prominent, and 3 shacks or small hangars were visible on the southeast side. 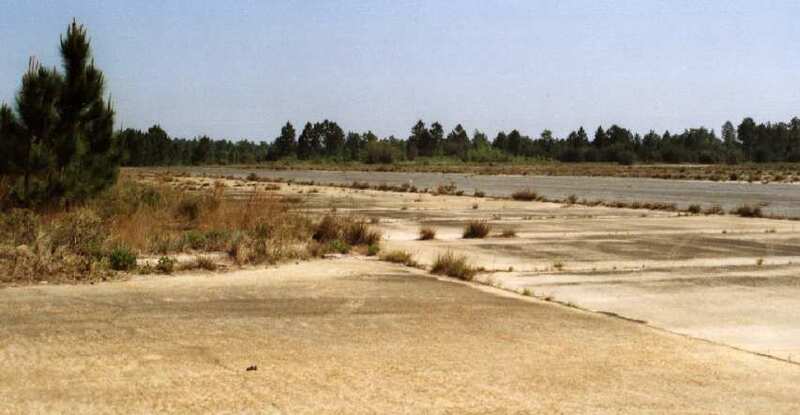 the middle of the site of Bayou Field had been covered in housing. A 2018 aerial view looking north at the site of Bayou Field. According to Brian Rehinkel, "Today most of the location of the former field is occupied by housing, with a small portion still remaining undeveloped (wooded)." 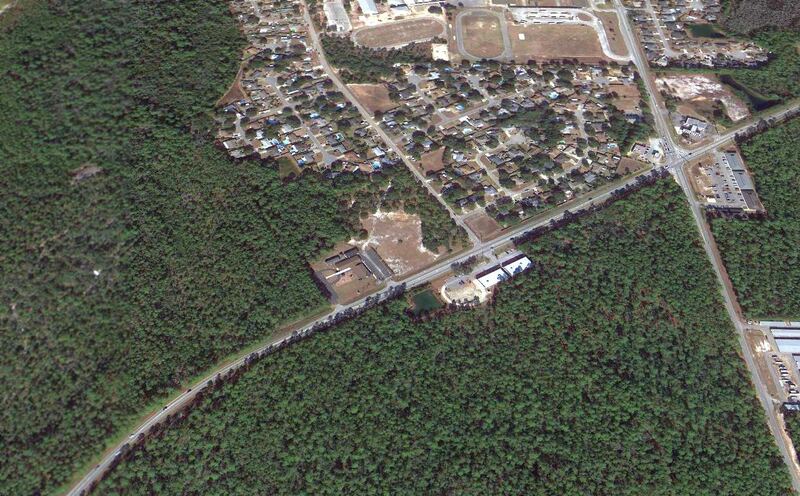 The site of Bayou Field is located south of the intersection of Route 292 & Gulf Breeze Avenue. The Pensacola Navy Yard was established in 1826. The Navy's flying school was established here in 1913, beginning a long association with naval aviation. although the aircraft based at the station still consisted of seaplanes & dirigibles. and built an airfield, initially called Station Field. An auxiliary field, Corry Field, was added that year. 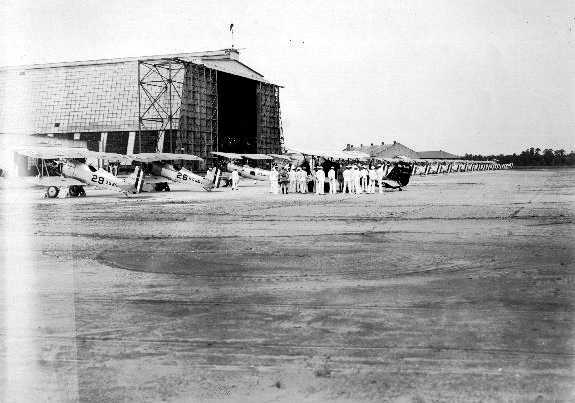 looking west at a long row of biplanes in front of the Chevalier Field hangars. An undated (circa 1920s?) view of rows of JN-1H trainers in front of 2 large hangars at Chevalier Field (from the Emil Buehler Library at the NNAM, via Maureen Keillor). 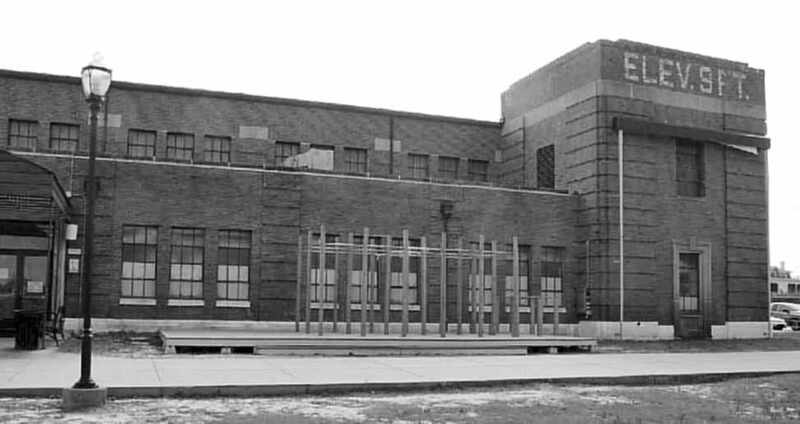 oriented northwest/southeast & northeast/southwest, with a row of hangars along the southwest side. with a row of hangars along the southern side. A 5/5/34 aerial view looking south at the 'Gymkhana Hop' stunt team of VN-508's F2B-1s performing aerobatics over Chevalier. 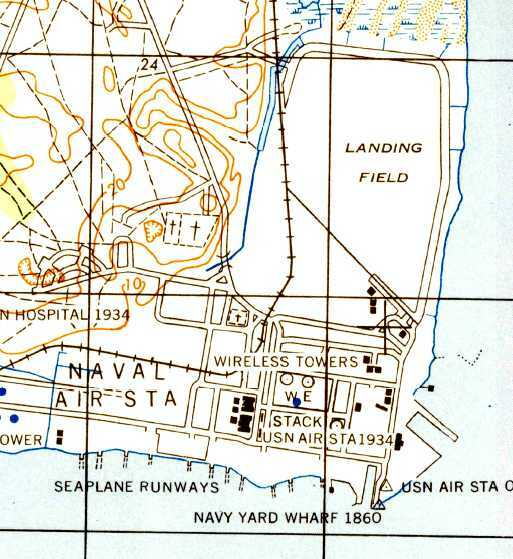 NAS Station Field, as depicted on the 1934 Navy Aviation Chart V-242 (courtesy of Chris Kennedy). as depicted on the 1934 Navy Aviation Chart V-242 (courtesy of Chris Kennedy). with an asphalt taxiway along the north & east sides. 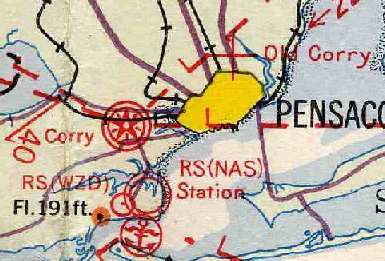 The August 1935 Mobile Sectional Chart depicted "Station (Navy)" Field. 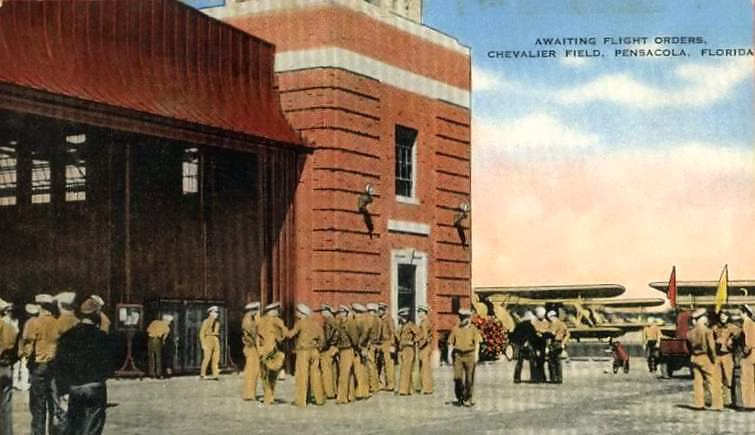 In 1935 the Navy enlarged Station Field, paved it, and renamed in Chevalier Field. An undated (circa 1930s?) 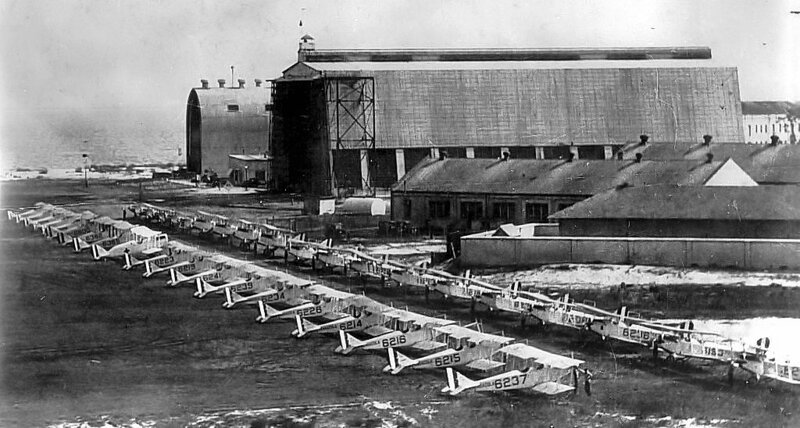 view of Vought O2U-3 biplanes in front of a Chevalier Field hangar. A 7/12/37 aerial view looking west at Chevalier Field (courtesy of Brian Rehwinkel). A blimp hangar & 2 aircraft hangars were at the south end of the field. Brian observed, “This photo shows the field after the south end had been partially paved. The north end of the field was still sod. This field is an interesting study in how the military fields changed over time. It was one of the first land fields the Navy built, and it was modified many times over the years. adding schools for aviation medicine & aviation maintenance. A procession of additional auxiliary fields were added in the next few years, including Saufley Field in 1940 & Ellyson Field in 1941. A 1941 photo of rows of North American SNJ-1 trainers in front of Chevalier Field's control tower. primary flight training at Chevalier increased in pace from 800 to 2,500 students per month. 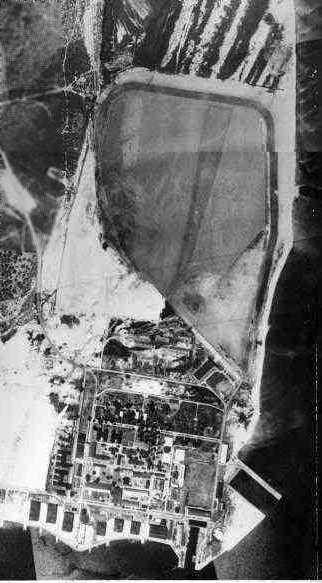 Chevalier Field continued to gain additional outlying fields during WW2, including Bronson Field & Barin Field in 1942, and Whiting Field in 1943.
and it became headquarters of the Naval Air Intermediate Training Command. with the larger one to the south of the airfield, and a smaller one to the northeast. A colorized postcard of an undated (circa 1940s?) Navy photo of Chevalier Field. A colorized postcard of an undated (circa 1940s?) photo of flight students in front of a Chevalier Field hangar. A 1943 photo of a busy Chevalier ramp, showing a Douglas R4D, Beech SNBs, North American SNJs, and a few biplanes (from the Emil Buehler Library at the NNAM, via Maureen Keillor). 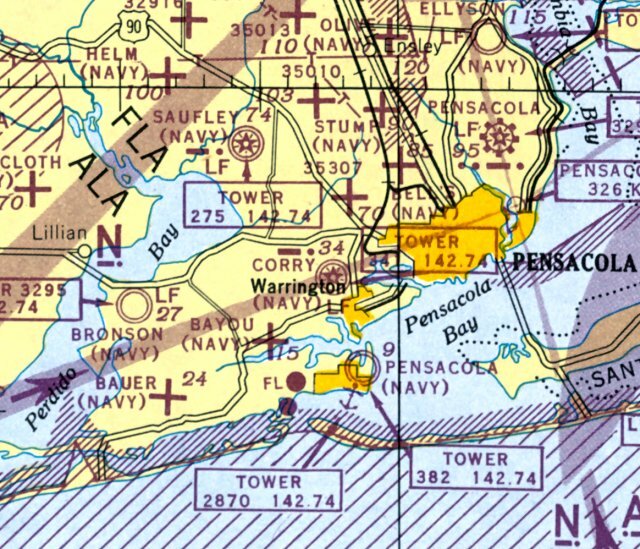 The 1944 USGS topo map depicted Chevalier Field as an open “Landing Field”, and depicted “Seaplane runways” to the southwest. A WW2-era view looking north at Chevalier Field (National Archives photo). The number of aircraft hangars at the south end of the field had been doubled to 4 since the 1937 photo, and the blimp hangar was still standing. 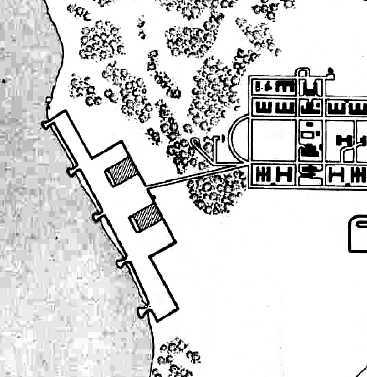 Note the seaplane facilities at the top-left. 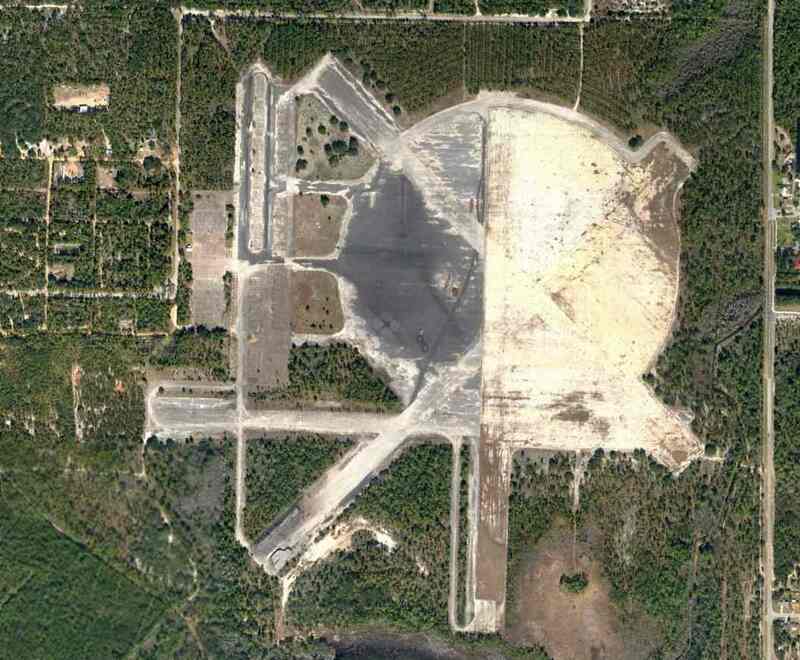 with a 1,100' diameter circular asphalt landing pad in the center of the southern runway cluster. Pensacola's staff transport aircraft were based instead at Corry Field. and SNJ, SNV, N3N & N2S landplanes. By the end of WW2, Chevalier & its auxiliaries had trained a total of over 28,000 pilots. 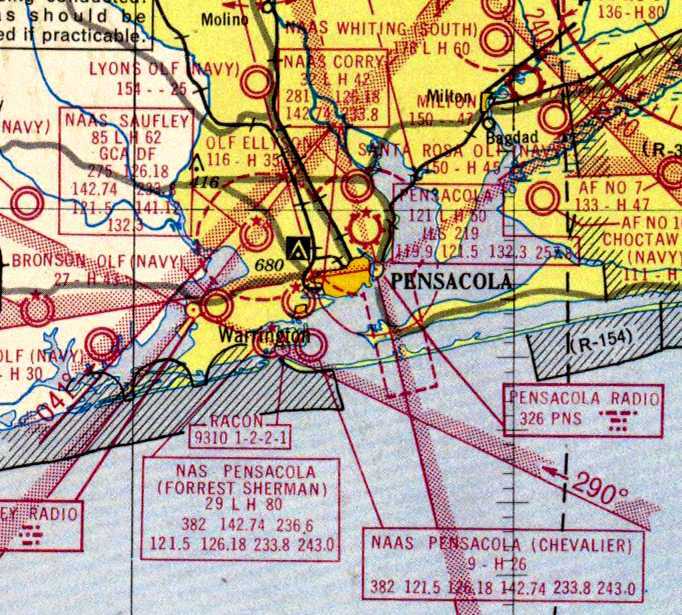 The incredible number of Navy satellite fields in the Pensacola area during WW2, as depicted on the July 1945 Mobile Sectional Chart. 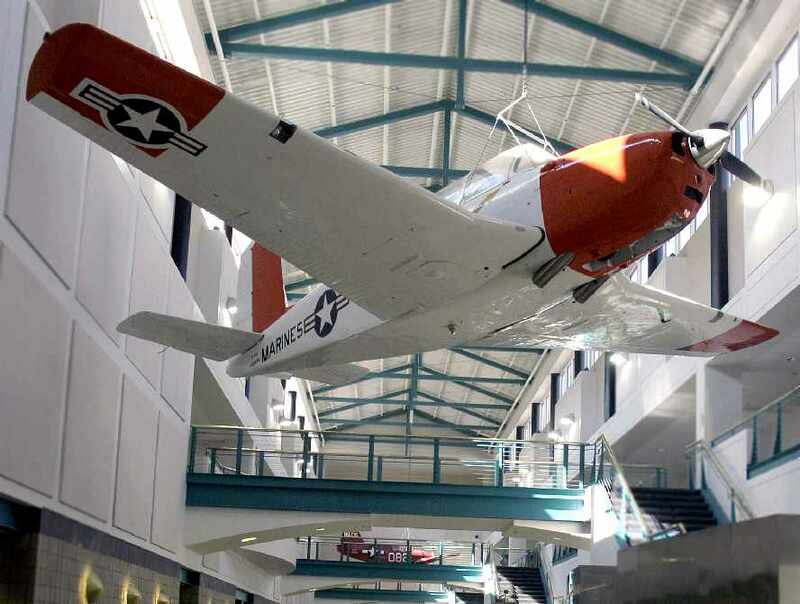 After WW2, Pensacola remained the headquarters of the Naval Air Training Command. An August 1949 photo (from the National Museum of Naval Aviation) of an SNJ-5 of the Blue Angels flight demonstration team in front of a Chevalier Field hangar. 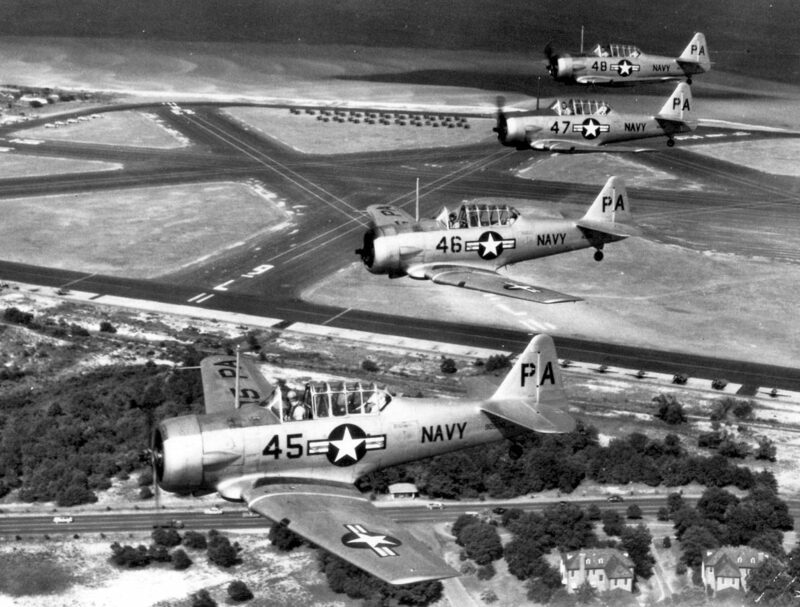 A circa 1950 aerial view (from the National Museum of Naval Aviation) looking east at a formation of SNJ-5 Texans of the IBTU overflying Chevalier Field hangar. A circa 1950 photo by Wayne Bancroft (courtesy of George Mihal of the Office of Image Archeology) of North American SNJ Texans in front of the Chevalier Field blimp hangar. 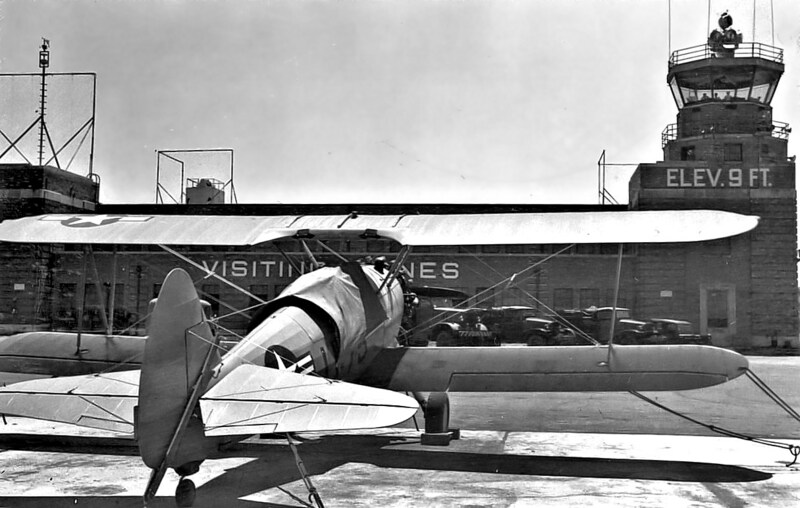 A circa 1950 photo by Wayne Bancroft (courtesy of George Mihal of the Office of Image Archeology) of a Stearman biplane in front of the Chevalier Field control tower. For the short runways of Chevalier Field, the advent of jet aircraft meant that its days were numbered. 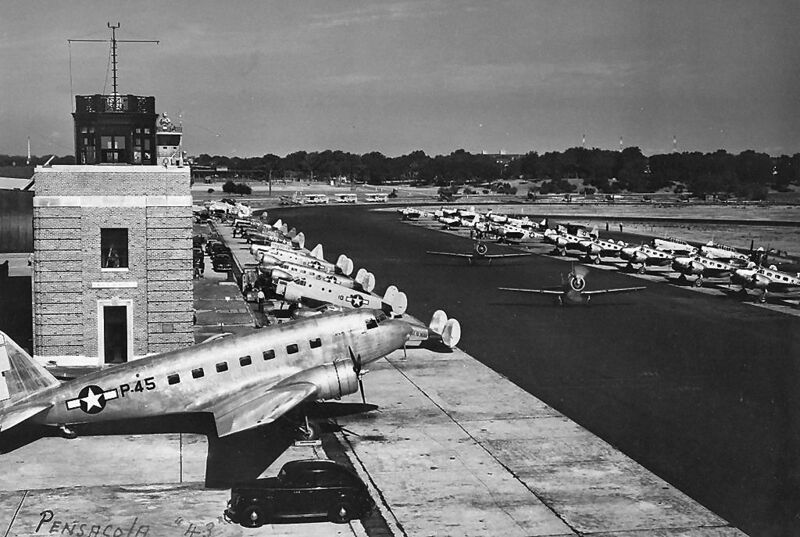 To provide the longer runways needed by jets, Forrest Sherman Field was opened in 1955, three miles to the west. 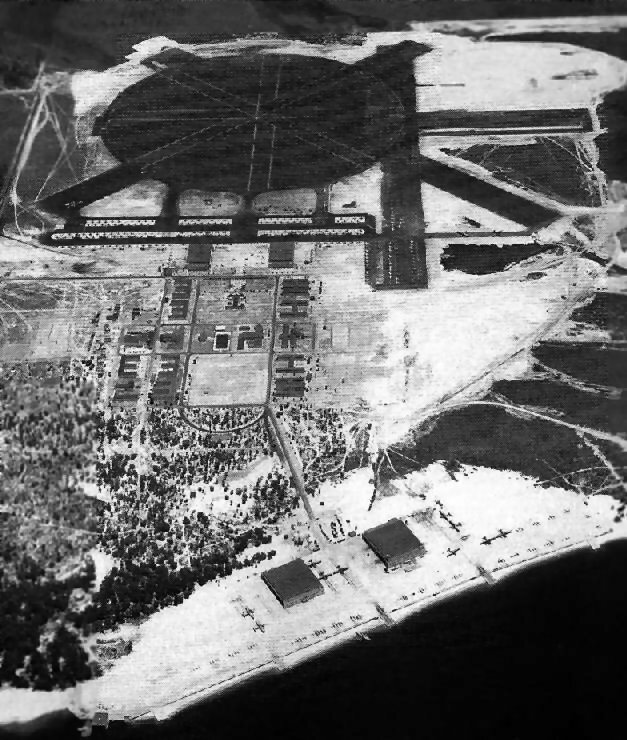 but the Naval Air Technical Training Center was eventually built over the southwest portion of the airfield. 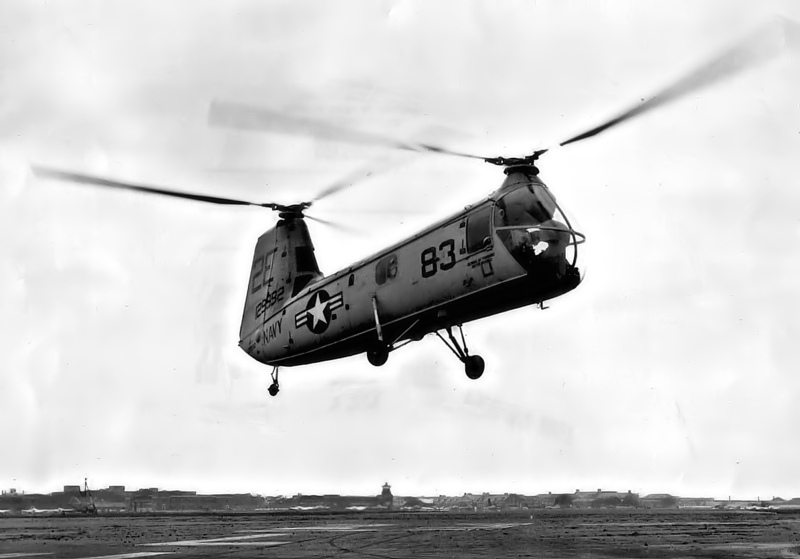 A 2/27/57 photo (from the National Museum of Naval Aviation) of a Piasecki HUP-2 Retriever assigned to NAAS Ellyson Field landing at Chevalier Field. 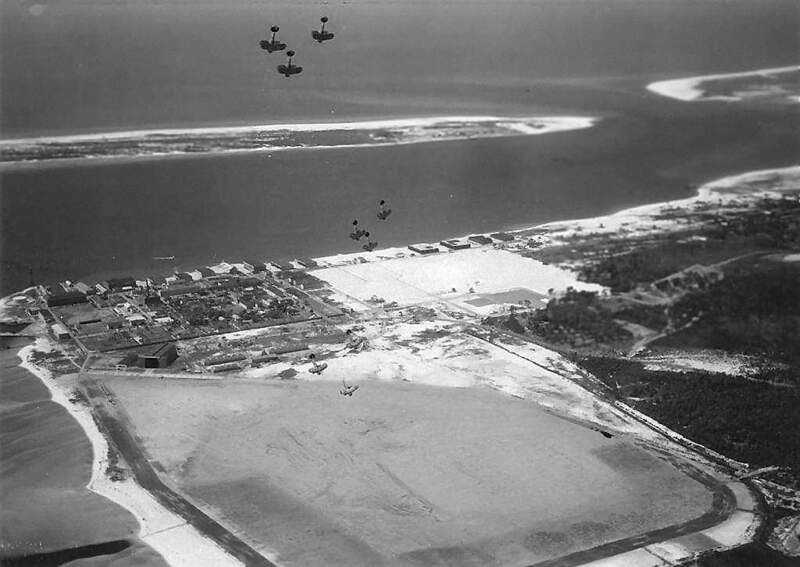 looking north at a flight of 4 Lockheed T2V SeaStars overflying Chevalier Field. as having 3 paved runways, with the longest being the 2,60' Runway 13/31. The blimp hangar was still depicted on the southeast corner of the field. 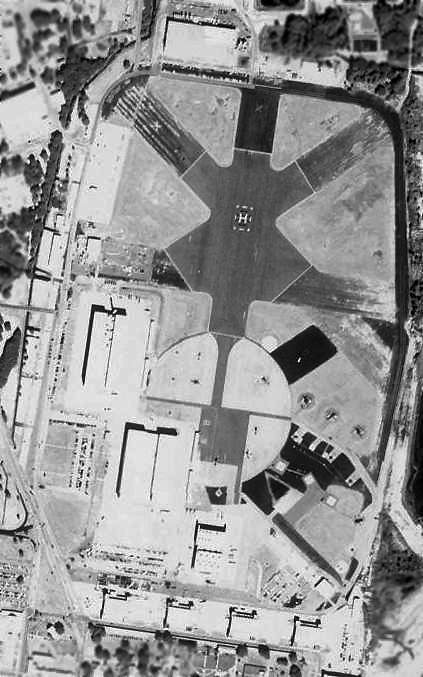 The March 1960 Mobile Sectional depicted “NAS Pensacola (Chevalier)” as having a 2,600' paved runway. 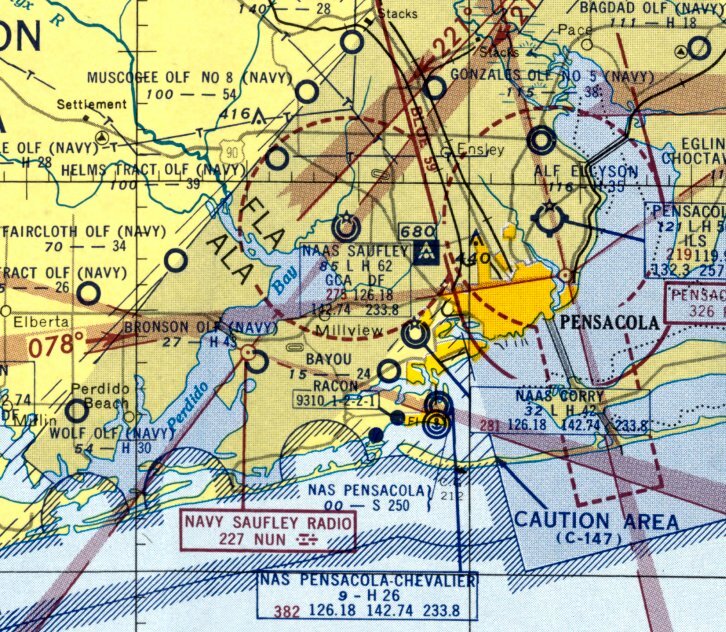 "NAS Pensacola (Chevalier Field)" was depicted as an active airfield on the 1964 Mobile Sectional Chart (courtesy of John Voss). The airfield was described as having a total of 7 asphalt runways, with the longest being 2,650'. However, the remarks said, "Runways 13R/31L & 9R/27L permanently closed. Closed to transients, local test flights only." 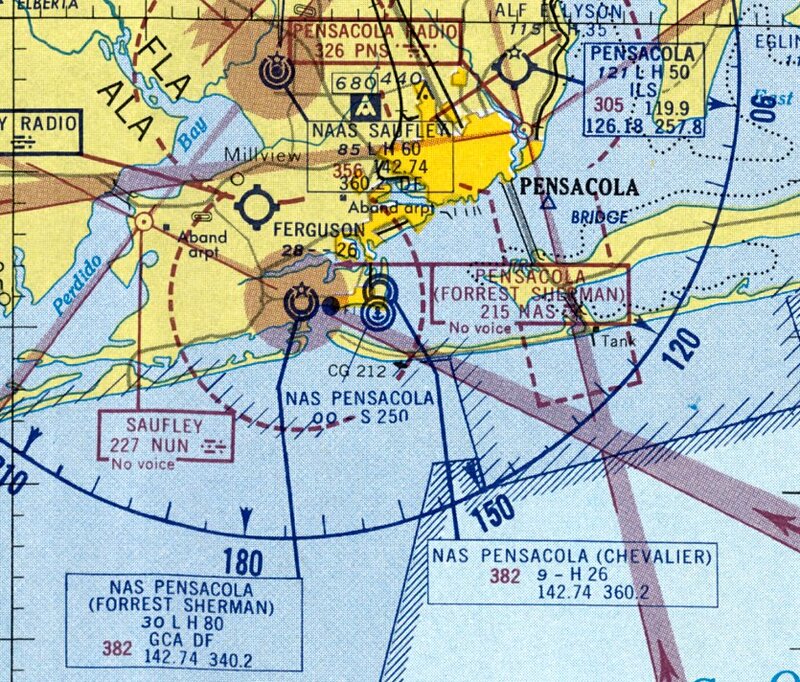 However it was labeled "NAS Pensacola (Closed)" on the February 1965 Mobile Sectional Chart. including some larger twin-engine aircraft on the south side. Rene' Freret recalled, “I was stationed at NAS Pensacola from 1970-74 and was assigned to Sherman Field Crash Crew. Many times I took my truck & crew to stand by at Chevalier Field on Mainside. 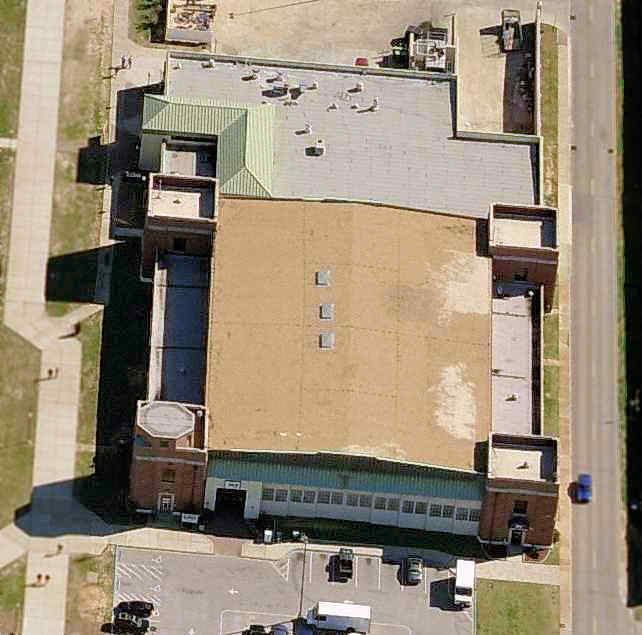 The large brick buildings around the southern edge were at that time Huey helicopter rework facilities. although it also depicted that 3 large buildings had been built over portions of runways on the southwest side of the field. These may have been hangars constructed for helicopter operations which were conducted at Chevalier Field during its latter days. 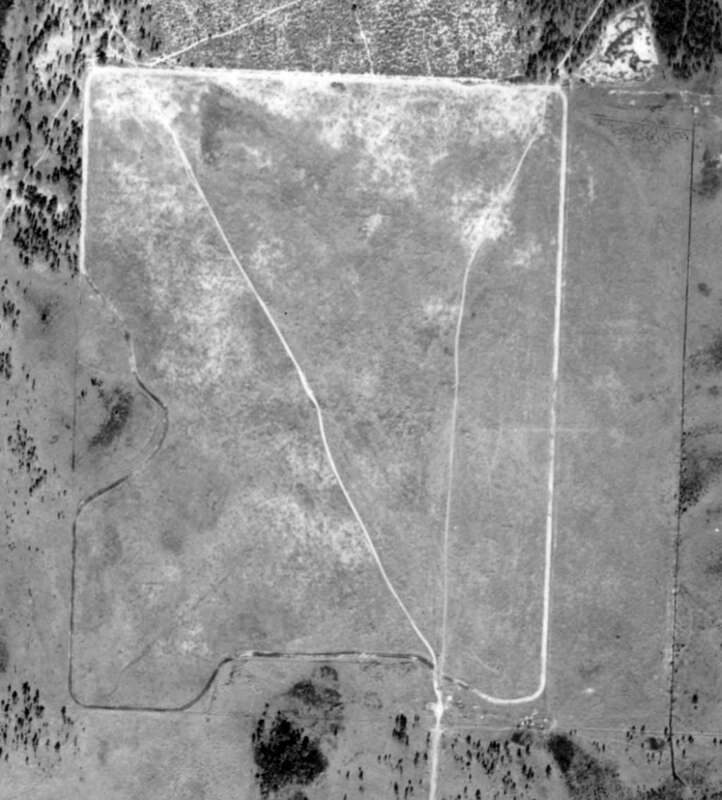 The 1930s-era blimp hangar had evidently been removed at some point between 1960-92.
as several helicopters were visible on parking spots in the southeast part of the field in the 1/30/94 USGS aerial photo. 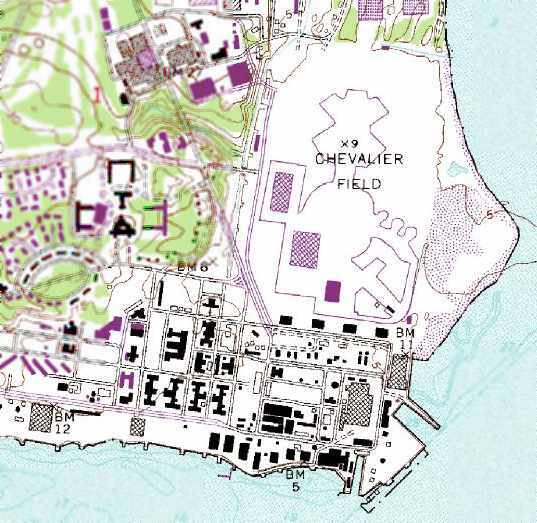 The use of Chevalier Field for helicopter operations apparently ended at some point between 1994-96.
located on the old Chevalier Field. and the NDI course from July 1998 - November 1998. I wasn't even aware that the area had been an airfield until my second time there. the new base exchange, a weight gym/movie theater, the new auto hobby shop, and a basketball gym. The large hangars on the West side of the field have all been incorporated into the new school. This is known as the 'megabuilding' which is an apt description. 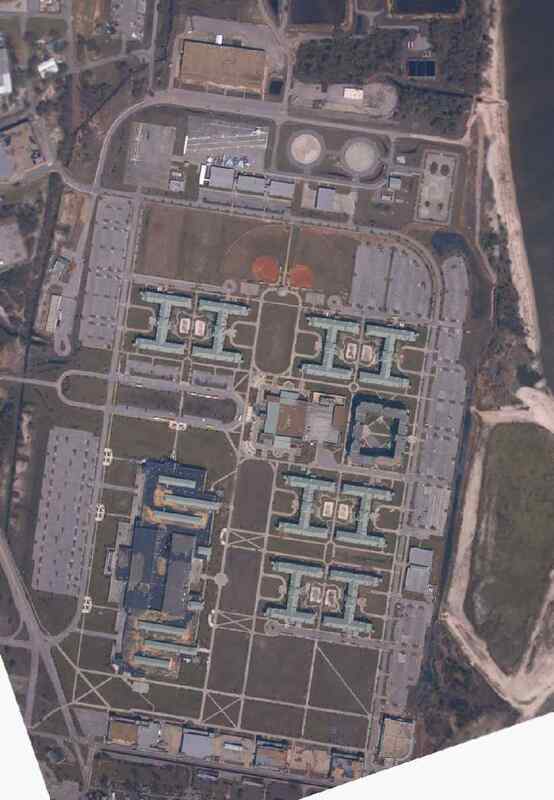 There are twelve barracks buildings & a mess hall located where the runways were. the area has been turned into a beautiful campus for the Navy & Marines aviation schools. 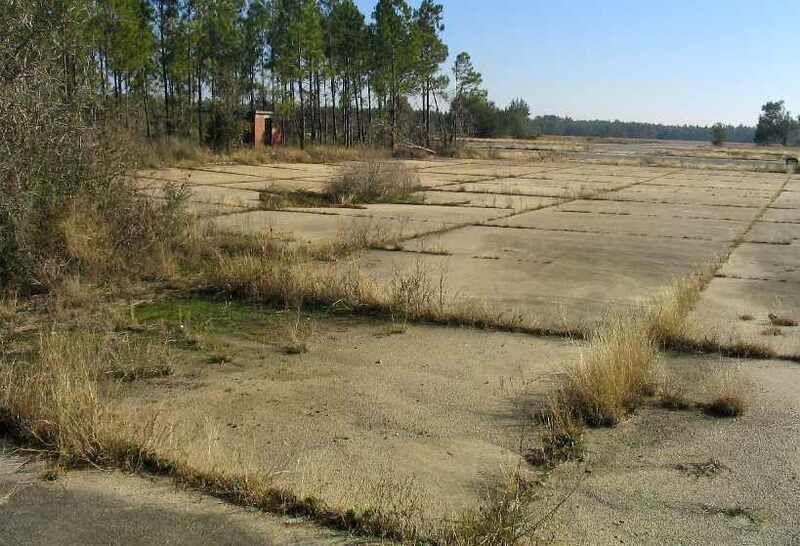 all of the remaining runway portions had been covered by buildings. has the remnants of a control tower on the northwest corner facing the NATTC. There is a sign on the control tower that clearly indicates the field elevation. There are also several seaplane hangars on the shoreline along Escambia Bay on the south end of the base. One of them has been converted to a gym." Chevalier was no longer listed with the FAA among active aviation facilities as of 2002. 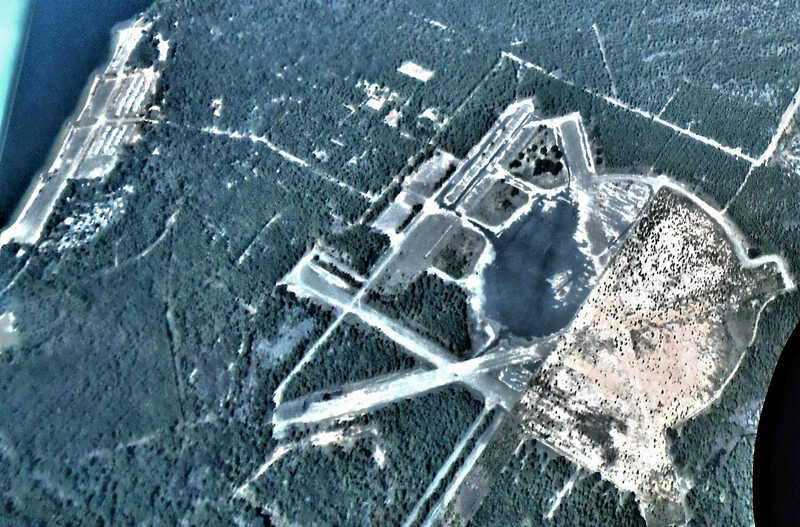 A September 2004 NOAA aerial photo of the former Chevalier Field (courtesy of Brian Rehwinkel). 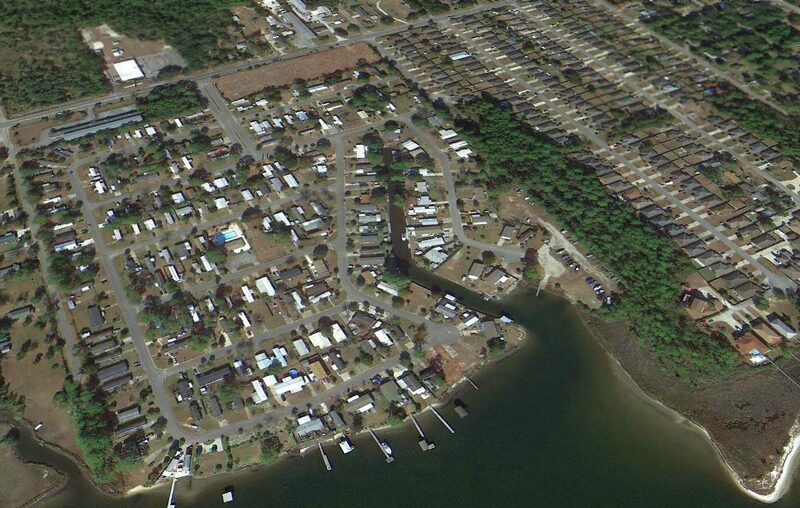 Note the drastic contrast in the configuration of the site compared to the 1994 aerial photo. with the only remaining hangars being the row along the south side of the field. and the pad on the right marked with the markings of an aircraft carrier. Note the variety of carrier-based aircraft (E-2s, AH-1, F-14s, S-3, and 2 F/A-18s in Blue Angels markings. of the newly renovated Chevalier Hall building at the Naval Air Technical Training Center at NAS Pensacola. Note a rare Culver TD2C-1 Turkey hanging in the background. A circa 2006 aerial view looking east at the hangar along the southwest corner of Chevalier Field. Note the former control tower base on the lower-left corner of the hangar (apparently the control tower cab had been removed). A January 2006 photo by Paul Freeman, looking southeast at the Aviation Division training facility adjacent to the north side of Chevalier Field. and an F/A-18 in Blue Angels markings. which remain standing along the south side of the former Chevalier Field. which remain standing along the west side of the former Chevalier Field. A January 2006 photo by Paul Freeman, looking southwest at one of the remaining former seaplane hangars at NAS Pensacola. with several extensively-damaged buildings in the process of being taken down. A December 2012 photo by Maureen Keillor of one of the WW2-era hangars which remain standing along the south side of the former Chevalier Field. 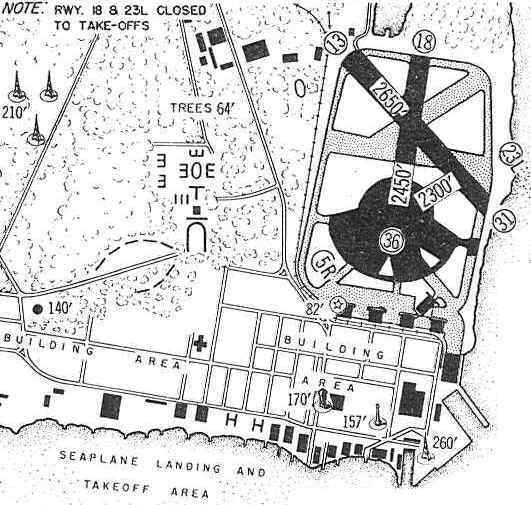 as depicted on a 1939 map of NAS Pensacola & its satellite fields (courtesy of Brian Rehwinkel). 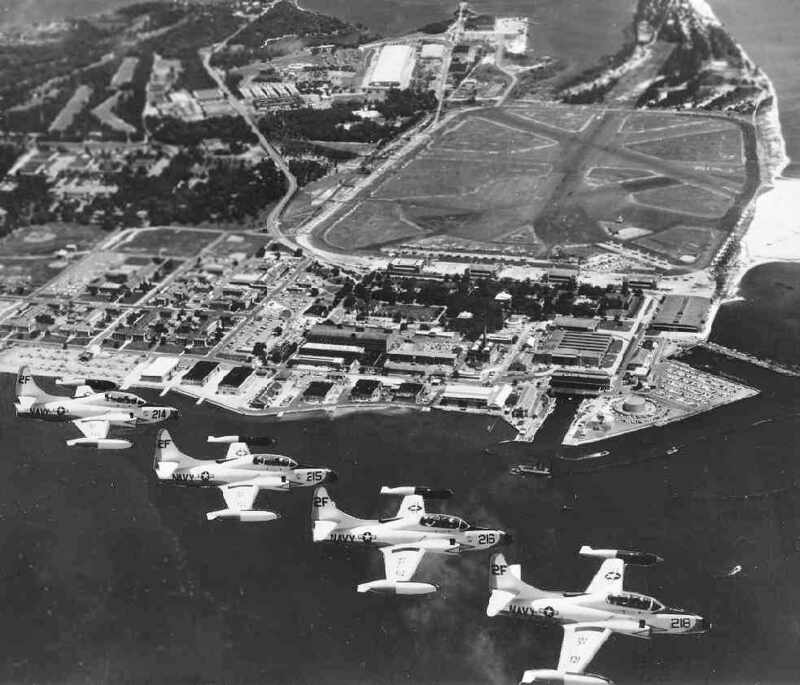 The Navy purchased 640 acres in 1939 to establish an outlying field for the use of trainer aircraft from Corry Field. It was initially known as Tarkiln Field, due to its proximity to Tarkiln Bay. 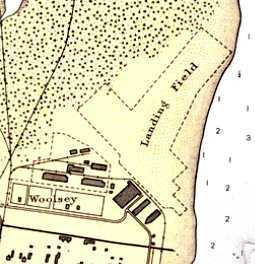 It depicted Tarkiln Field as a rectangular area. 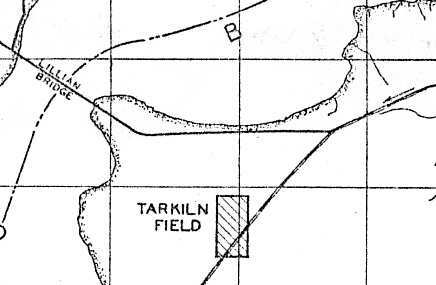 The 1941 USGS topo map (courtesy of Dallam Oliver-Lee) depicted Tarkiln Field as an empty unlabeled rectangular area. 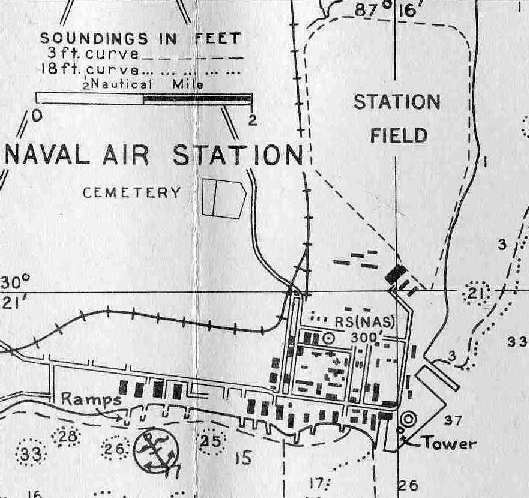 Bronson Field & Bauer Field, as depicted on a 6/30/42 map showing the location of Outlying Fields for NAS Pensacola (courtesy of Brian Rehwinkel). 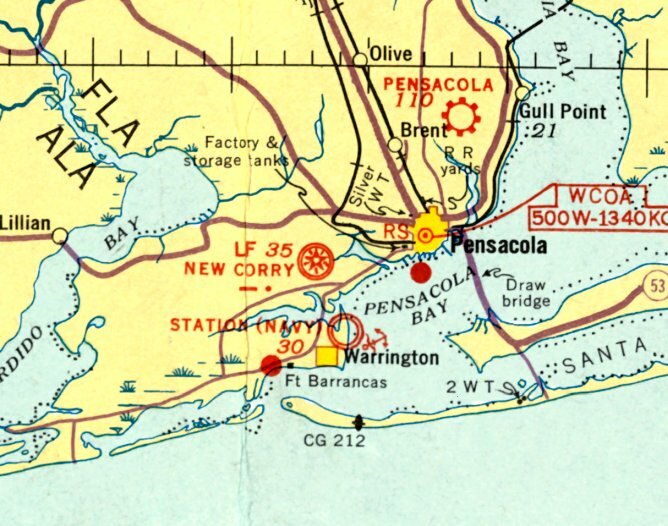 and the Navy purchased an additional 263 adjoining acres on the shore of Perdido Bay to establish a seaplane facility. The 2 installations were commissioned on 11/18/42 as NAAS Bronson Field. with a hangar visible in the background. with the control tower visible in the background. with SNJ Texans also visible in the background. 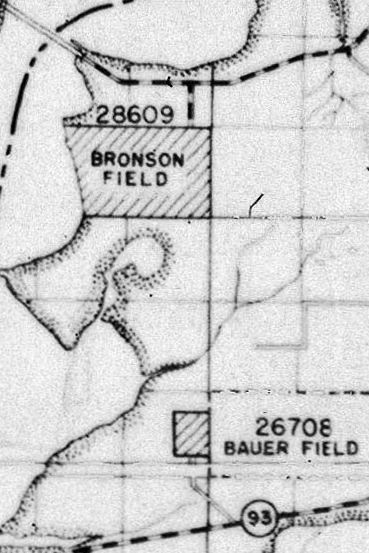 Strangely, Bronson Field was not depicted at all on the 1944 USGS topo map. 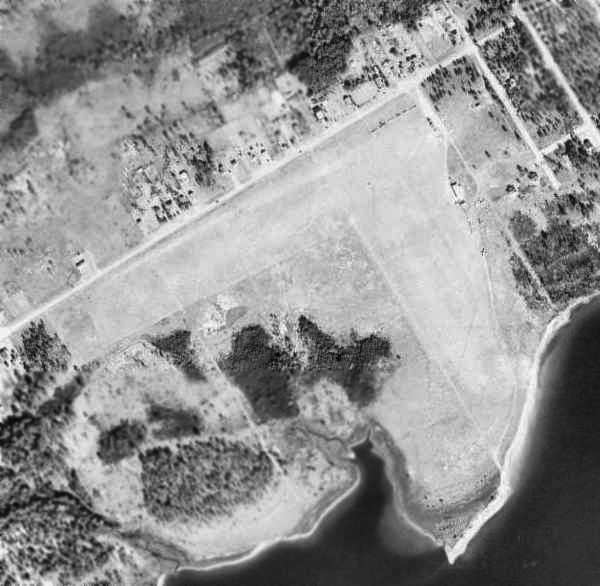 A WW2-era aerial view looking northwest at the runways & seaplane ramp at Bronson Field (National Archives photo). crisscrossed by 4 asphalt 4,000' runways, along with taxiways, ramps, and 2 hangars. 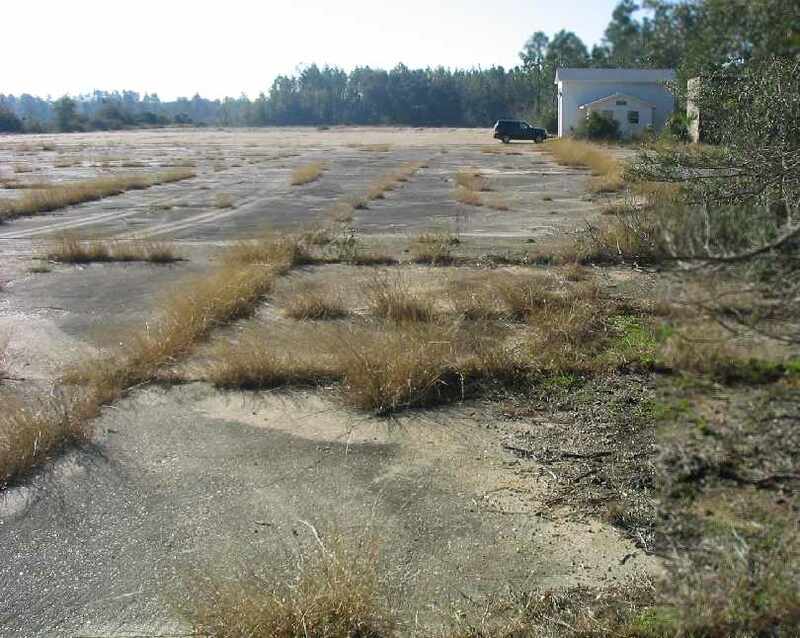 The seaplane facility consisted of 2 hangars, a large parking apron, and 5 seaplane ramps leading down into Perdido Bay. 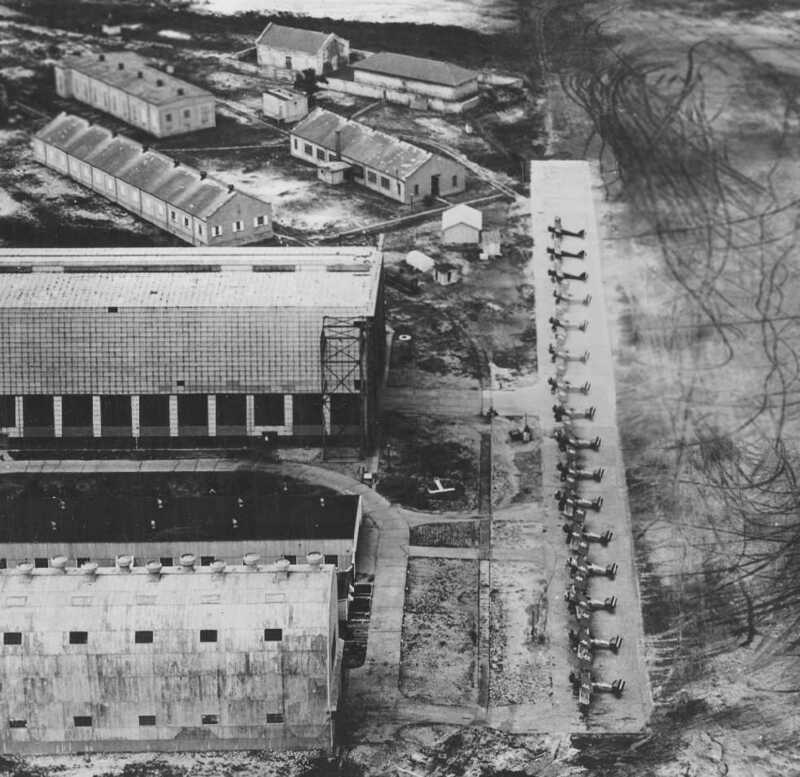 A large complex of barracks in between the 2 flying facilities was capable of housing a total of 2,928 personnel. and ultimately operated nearly 300 SNJs from Bronson Field. The squadron also operated a smaller number of N2S Stearmans. At the seaplane base, VN-8 operated 40 PBY Catalina flying boats. as having a large apron with 5 ramps leading into the water, and 2 hangars with 119' x 30' doors. The field was said to be owned by the U.S. Government & operated by the Navy. and a 2,500' circular asphalt mat. The field was said to have 2 wooden hangars, the largest measuring 300' x 174'. 30014 Faircloth Outlying Field, and 28817 Kaisers Tract Outlying Field (8 miles WNW). "Bronson (Navy)", as depicted on the July 1945 Mobile Sectional Chart. 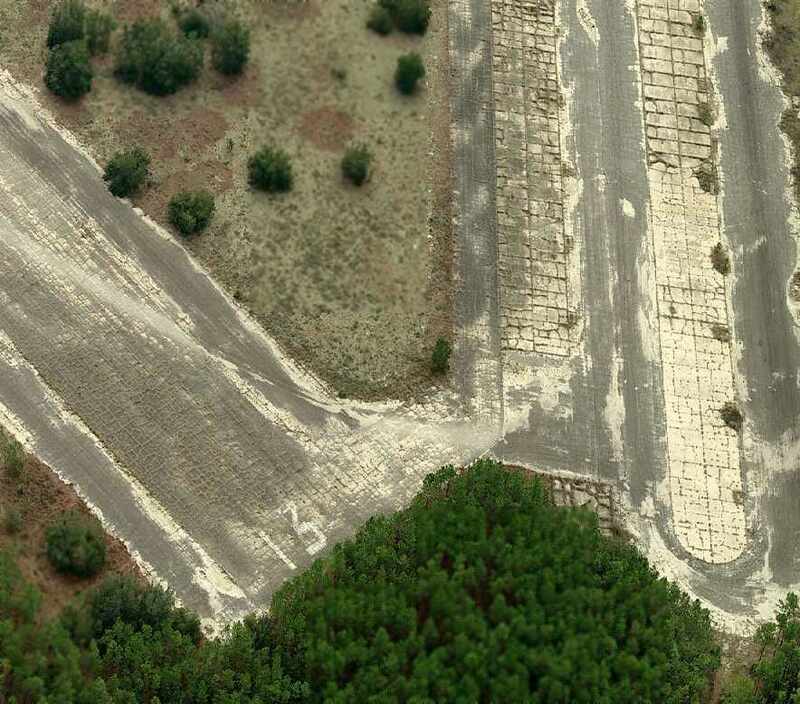 Faircloth Airport (Lillian, AL) & Kaiser's Tract (Elberta, AL). in all likelihood making it the last grass field in use by the Navy. No trace remains of either of these outlying fields today. Bronson closed as a NAAS in 1946, but it remained in use as an outlying field. but continued to use the hangars for parts storage for the next 10 years. showed the field remaining intact. 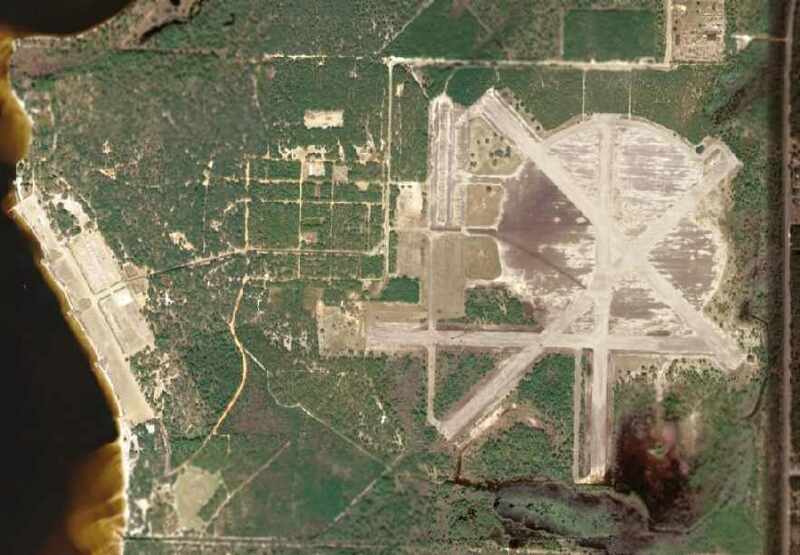 (among a dizzying array of Pensacola-area airfields) as having a 4,300' paved runway. Robert Cooper recalled, “In 1958 the Navy decided to sell all of the old SNJ trainers which had been gathered at Bronson Field. All but 2 of them were bought by 2 different salvage dealers. and the Navy allowed them to cut a hole in the fence & drag all the planes to their leased property. 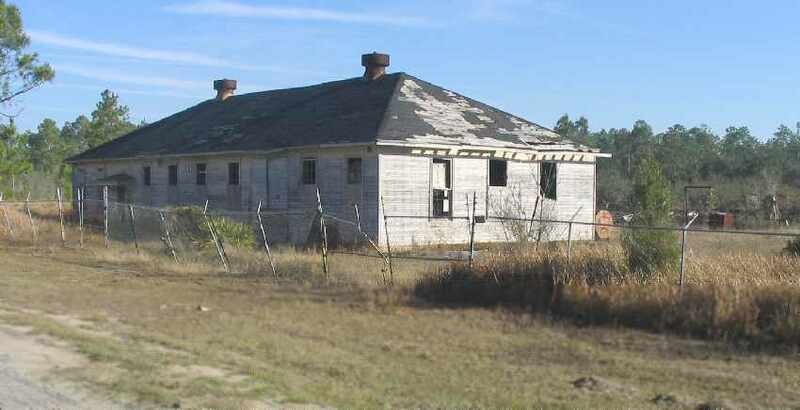 The building [the wooden building just north of the airfield] was their sales office & parts storage. It did not belong to the Navy. A short dirt strip was cleared leading away from the entrance road & most of the planes were flown from there. I personally flew at least 25 of the planes from there to Pensacola airport where their new owners picked them up. At least 2 of the planes crashed departing from this site due to their new owners' unfamiliarity with the aircraft. with a strip just wide enough for the wings down through the bunch & only about 600' long. when they were included in a separate lot of surplus material & sold. 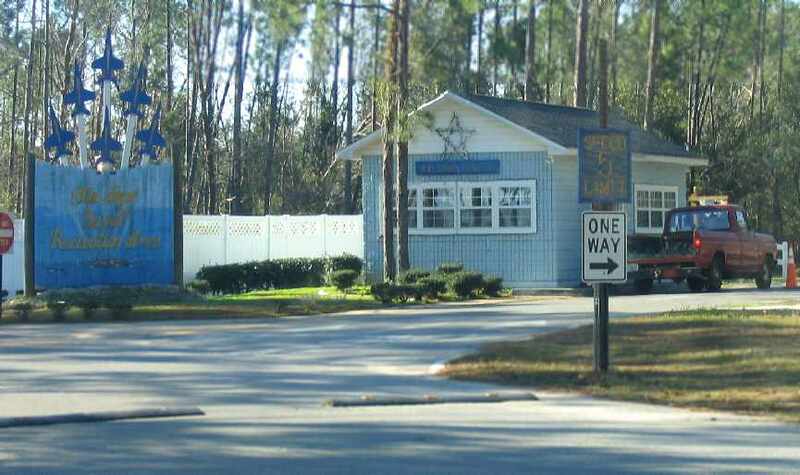 and delivered it to him at Brooksville, FL. As best I can remember the planes sold for from about $350 to $800. Mr. Ferguson of Ferguson field, a former Navy pilot bought several of them. "Several building have been torn down...although all 4 hangars were still standing [including the 2 hangars on the seaplane ramp]. The airfield itself looked to be in decent condition." cleared as an ad-hoc airfield by salvage dealers to fly out large numbers of surplus SNJs. 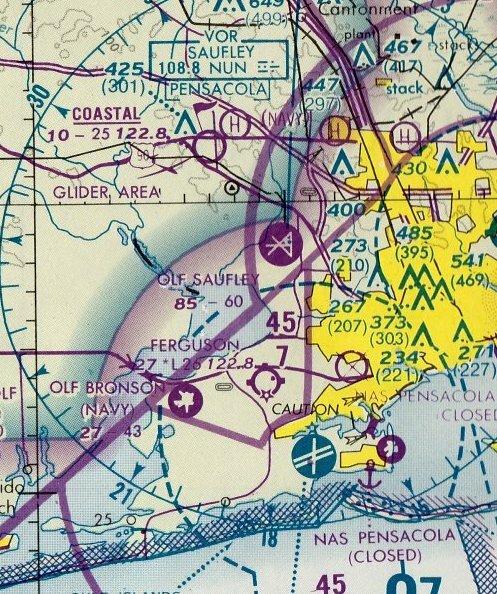 "OLF Bronson (Navy)" was still listed as an active airfield on the 1964 Mobile Sectional Chart (courtesy of John Voss). along with the remark, "Intensive Student Pilot Training." showed that all 4 of Bronson's hangars had been removed at some point between 1958-65. 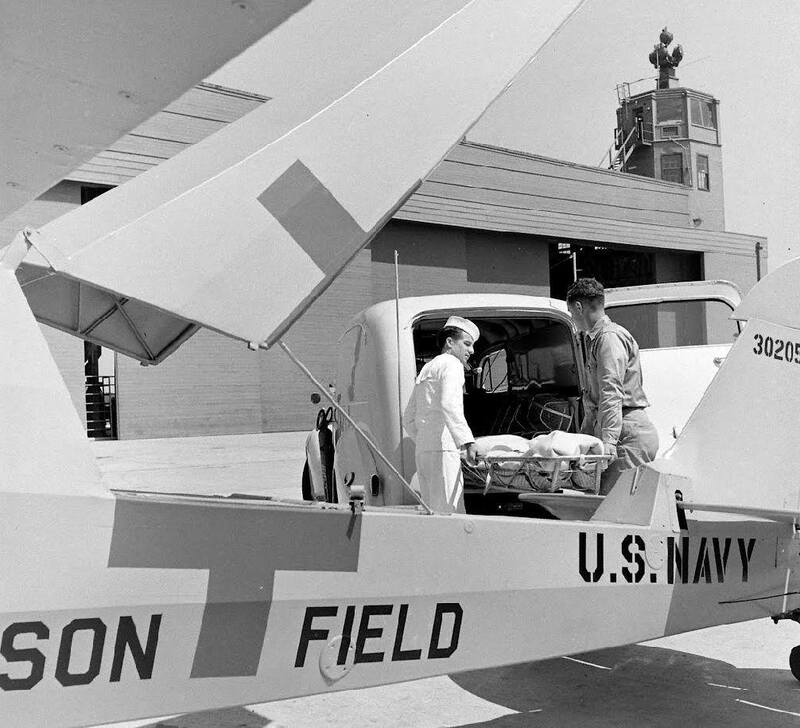 In 1967 Bronson Field was the last stop for Naval Aviators as they completed their flight training in the T-28 Trojan. The tailhook-equipped T-28C was used at Bronson for Field Carrier Landing Practice prior to the final flight to the aircraft carrier USS Lexington just offshore for actual arrested landings. At that time Bronson Field was in such a state of disrepair that it felt like it had been abandoned many years earlier. Grass grew through cracks in the tarmac. There was no other activity at the field other than 10 or 12 student pilots who flew the carrier landing pattern 1-3 times a day as they prepared to "hit the boat" on their last day. 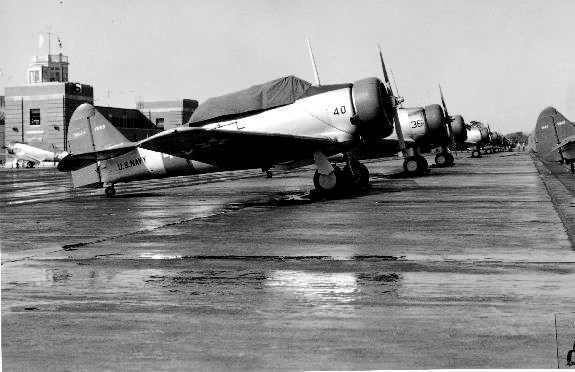 Ten or twelve T-28s were the only aircraft parked on the ramp. and to debrief the landings as the pilots honed their skills during the 10-day course of instruction & practice at Bronson Field. There were also enlisted mechanics on hand to service the aircraft, fix problems, and act as ground crew. 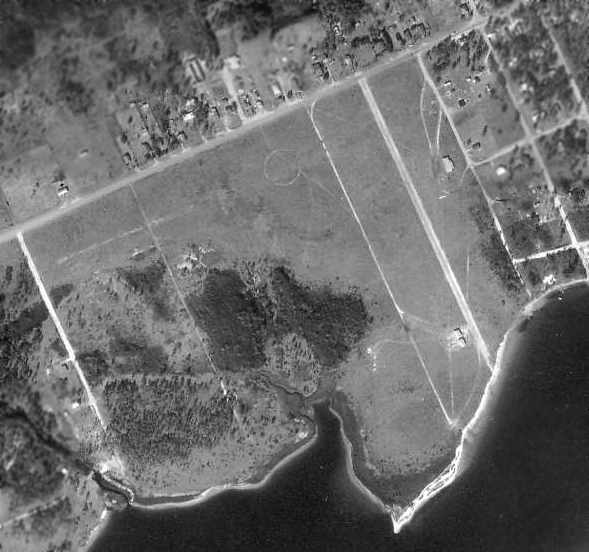 numerous taxiways, a street grid to the west of the airfield, and the seaplane ramp along the coast. Kevin Fitzpatrick recalled that "Back in the 1970s my Boy Scout troop used to camp [at Bronson] regularly. and very large regional camporees with thousands of scouts were held there. By that time all of the buildings were gone but the foundations remained. Also the tall water towers were still there & some of us were brave (stupid) enough to climb them. The field was still used for touch & goes then by trainers. and was a huge open field of grass shoulder high. and seeing my first wild porpoise out in the bay." 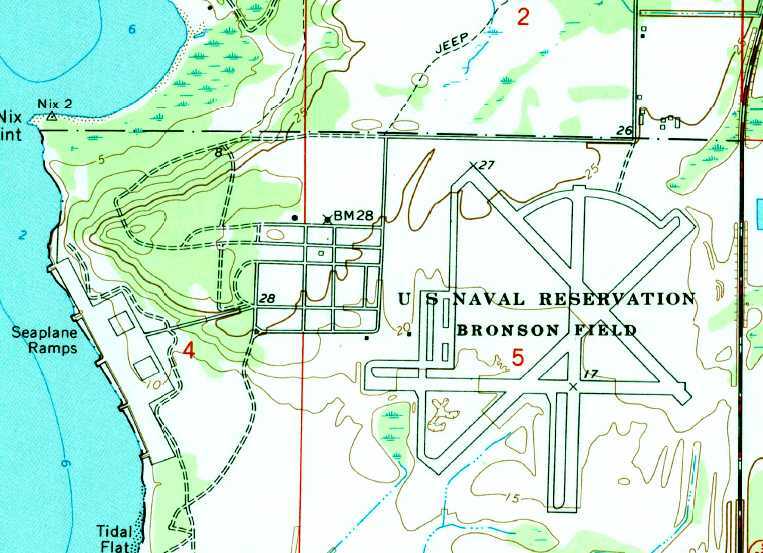 "OLF Bronson (Navy)" was still depicted as an active airfield on the 1980 New Orleans Sectional Chart. 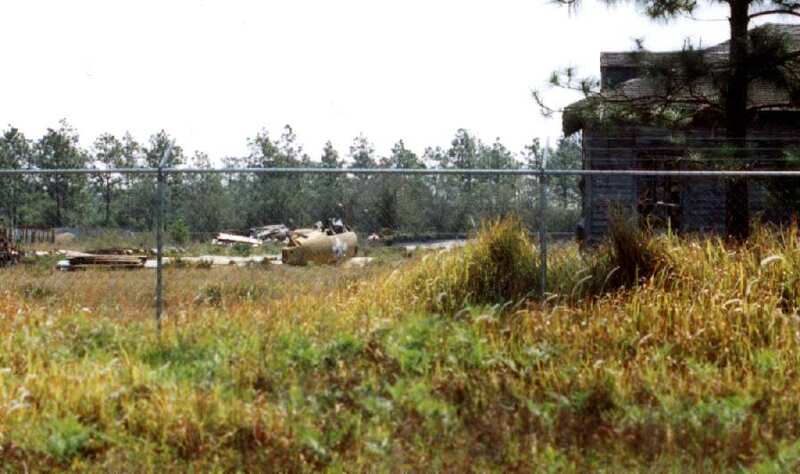 A sad sight - a 1987 photo by John Voss of an SNJ Texan fuselage, sitting forelorn at the former Bronson Field. "There were a number of SNJ fuselages at Bronson... maybe a dozen, all in a neat row. I also spotted numerous SNJ wings all stacked up like fallen dominos. 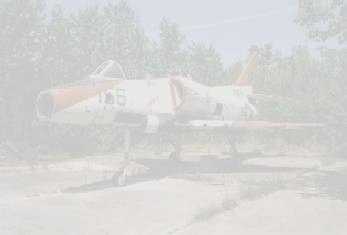 There was a wooden building in the immediate area that seemed to be full of aircraft parts as well. 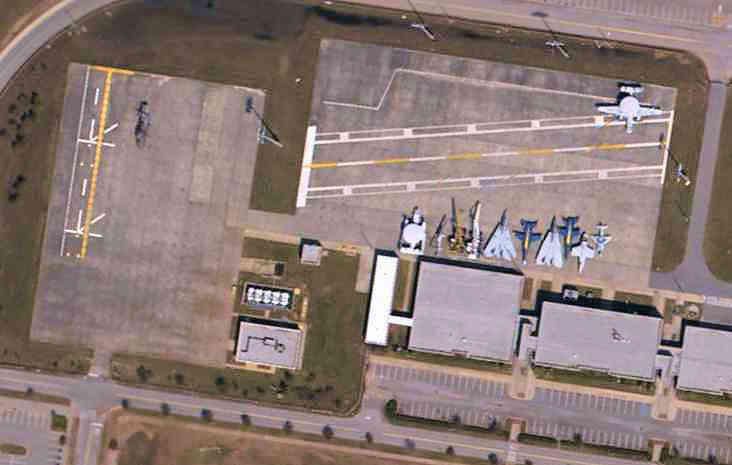 My guess is that they were in storage for the Naval Air Museum at nearby Pensacola." These were the remnants of the SNJs sold from this location in 1958. A 1987 photo by John Voss of the airfield pavement at Bronson Field. although the hangars had been demolished. The runways at Bronson were still used as late as 1993 for practice landings by Navy helicopters. 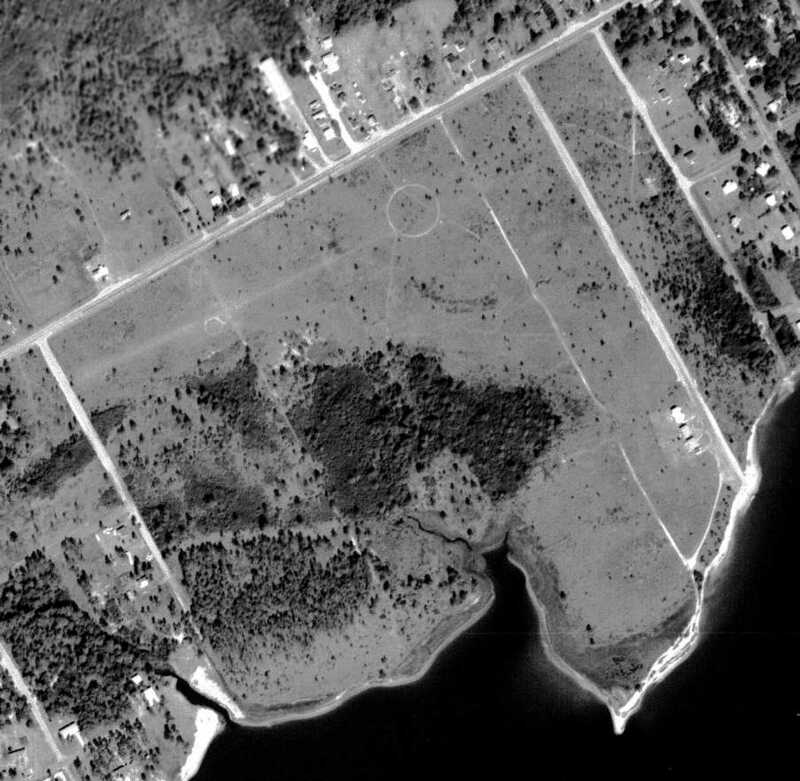 A 2004 aerial view of Bronson Field, with the seaplane ramp to the west of the large airfield. being dumped on the Bronson Field pavement. Bronson Field's runways have occasionally been reused for weekend automobile races. just northeast of the Bronson airfield. These were the buildings which had been used for the sale of the surplus SNJs in 1958.
but there was no sign of the SNJ fuselages which had been photographed next to these buildings by John Voss in 1987. A January 2006 photo by Paul Freeman looking south, showing a 2-story building on the western edge of the ramp. showing a brick shack on the northwest side of the former ramp. A January 2006 photo by Paul Freeman, looking east across the huge expanse of the former airfield. Several large trucks were visible on the far (east) side of the airfield. which occupies the site of the former seaplane area on the west side of the base. (previously photographed as late as January 2006) was burned down. 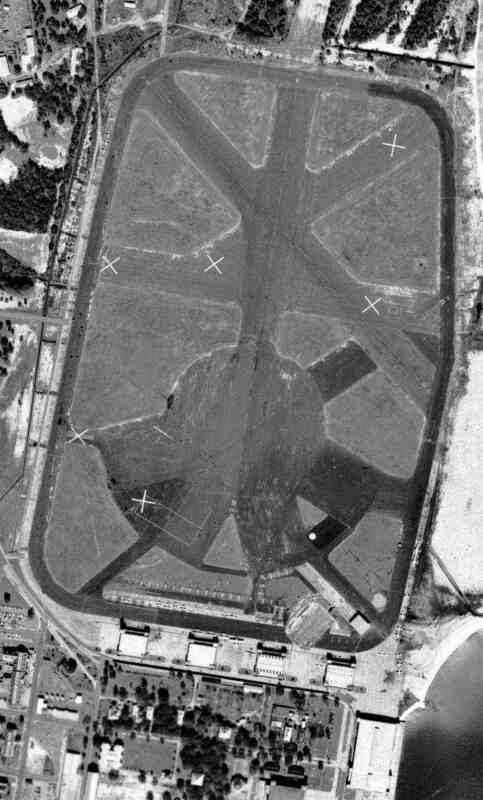 A circa 2006-2007 aerial view looking south shows the last runway markings which remain visible at Bronson Field, for Runway 13.
had been painted with “HC-16 Bullfrogs 1974-1994”. The runway pavement on the southeast side of the airfield had been removed. A 2/1/13 aerial view (courtesy of Dallam Oliver-Lee) showed the Bronson airfield to remain intact though deteriorated. A 9/3/16 photo by Matt Franklin of the remains of the Bronson Field paved circle. Matt reported, “They’ve pulled up half of the circle, but it is still a paved monstrosity in terms of sheer size of pavement. The area where the trainers were flown off is completely overgrown with trees and you’ll likely get Zika from just looking at it. Too bad the fuselages were gone, one could feel like Indiana Jones hacking their way through the forest to buried treasure. The police seem to use it for vehicle training, but unlike The Police they do not watch every step you take nor every move you make, as it was abandoned on the day I visited. A 9/3/16 photo by Matt Franklin of the remains of the Bronson Field ramp. A 9/3/16 photo by Matt Franklin of the remains of a Bronson Field taxiway. A 1/25/18 aerial view by Alex Price looking northwest at the remains of the Bronson airfield & seaplane ramp.